Kenyan MPs have asked how a 10km wire fence built along the country’s border with Somalia cost $35 million. The government had originally promised to build a complex wall to run about 700km (435 miles) along the border. But the “wall”, which was meant to stop al-Shabab militants from crossing into Kenya, has ended up being a wire fence that is only 10km long. Kenya’s parliament has now suspended construction, and is demanding an investigation into the project. When the plan was first announced in 2014, the government said it would build a 708km wall made up of a series of concrete barriers, fences, ditches, and observation posts overlooked by CCTV stations. Under this plan, the wall was meant to stretch from the Indian Ocean all the way to the border region of Mandera, where Kenya and Somalia meet Ethiopia. The idea, ministers said, was to tackle illegal trafficking and immigration – and most pressingly, to keep al-Shabab militants in Somalia from crossing over into Kenyan territory. 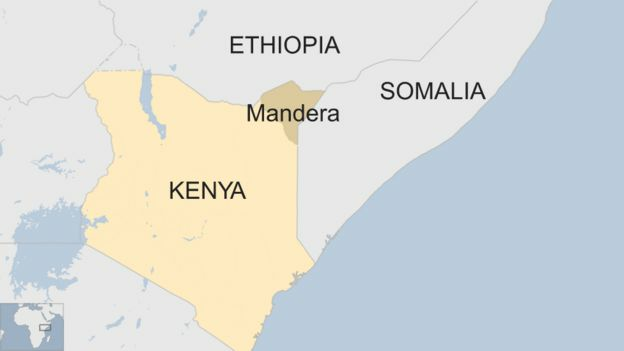 Kenya had suffered a series of devastating attacks at the hands of al-Shabab – including a massacre in a quarry in Mandera in December 2014, in which 36 non-Muslims were killed. Construction started a year later, in 2015. What has actually been built? Four years later, there is a chain-link and barbed wire fence that is just 10km long – a far cry from the mega-wall that was initially promised. And how much has it cost? Altogether it cost 3.4 billion Kenyan shillings – that is, $35 million, or £26 million. At 10km long, that works out to around $3 million per kilometre. To put it in perspective, the BBC’s Ferdinand Omondi in Nairobi notes that this is more than double the amount of money the Kenyan government has put aside for its strategic food reserves this year. What has Kenya’s parliament said? To put it mildly, Kenyan MPs are not happy. Speaking in parliament, some politicians questioned how effective a wire fence could really be at keeping militants out of the country. Others went further, and said that they suspected corruption – specifically, that officials may have taken advantage of the threat from al-Shabab in order to steal money from the public. Parliament has now blocked any further allocation of funds to the fence, and has demanded that the state explains where the millions of dollars spent so far have gone. The fence has been built under the supervision of Kenya’s military, and their accounts are classified.